One common way to backup the VMware vCenter Server Appliance (VCSA) is to manage as a common VM and use a backup solution to backup (and restore) the entire VM. But it’s approach does not always work, for example in the case of a database corruption the VM restore could be not working. 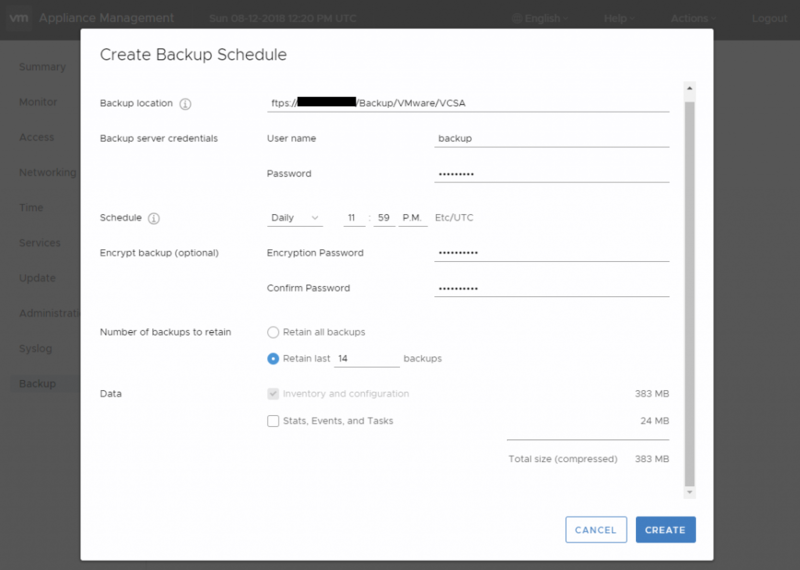 Starting with vSphere 6.5 and the new VCSA 6.5 was possible to use also a native backup solution integrated with the vCenter Server Appliance Management Interface (VAMI). But it was a manual operation (some scripts are available to automate and schedule it). 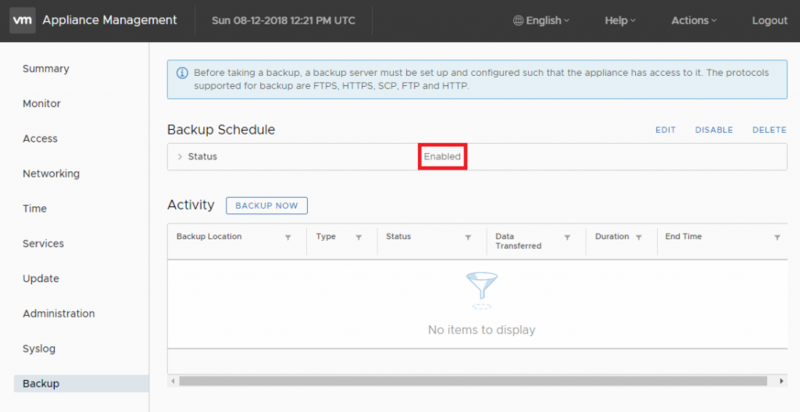 Finally, with vSphere 6.7 it’s now possible to schedule the backup of the VCSA directly from the VAMI. The entire VAMI has a new UI, much clean and clear and more similar to the vSphere Client (HTML5) UI. 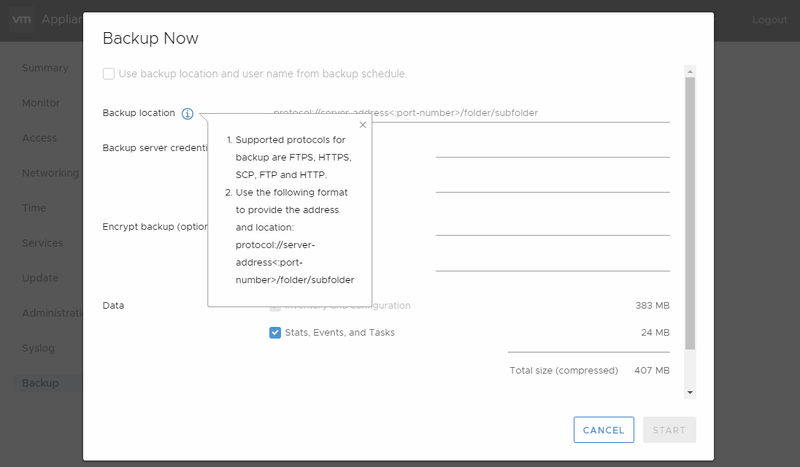 The supported backup targets remain the same of the v6.5 version: FTP, FTPS, HTTP, HTTPS and SCP servers. 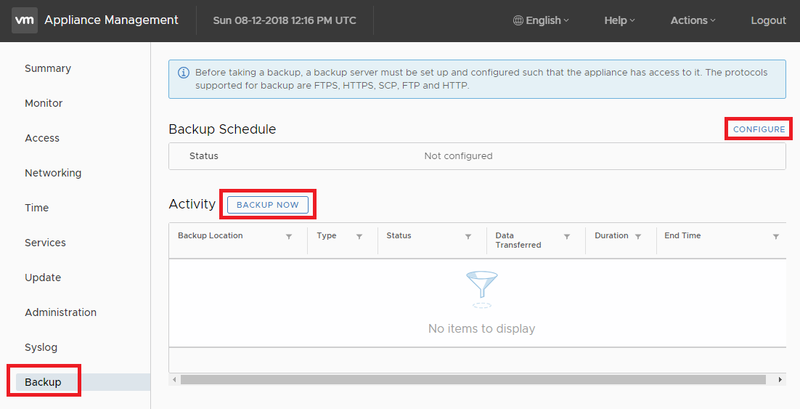 Create a new backup schedule is quite easy: specify your backup destination, the proper credential, the proper frequency, the retention, the type of data that you want to save (inventory and configuration only or also stats, events, and tasks) and if you need to protect the backup with encryption. Then the schedule will be enabled. Note that only one schedule is possible. How data are stored? 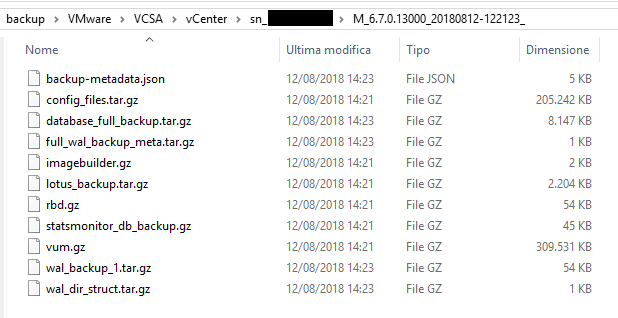 In a really structured set of folders: first the vCenter folder, than the sn_ID (where ID is the VCSA identifier) folder, then a folder with the version for the VCSA and a timestamp for backup. In this way you can use the same target setting for different VCSA, the subfolders will be different (but I’ve not tested to verify how retentions are kept). Nice also that you can see the build of your VCSA, useful also for differentiating the sub-folders in case of VCSA update. Is it all done? Not yet… something could be still improved. For example, the notification part is missing the UI. Then the manual backup can only grab part of the data from the schedule, but not all, and this is silly (you have to re-enter them). And finally, some optimization could be useful: like have multiple schedules (at least one short-term and one long-term) and more granularity on what you can store in the backup. And why not integrate this tool with another backup (or export) features in the vCenter Server interface, like DVS or host profiles export? << Is the HTML5-based vSphere Client finally mature?